Pilots of No. 452 Squadron: Brendan “Paddy” Finucane (centre), Keith William “Bluey” Truscott (left) and Raymond Thorold-Smith (right). 1941, Kirton in Lindsey. 452 carried the code letters “UD” and the aircraft behind the pilots is a Spitfire Mk. 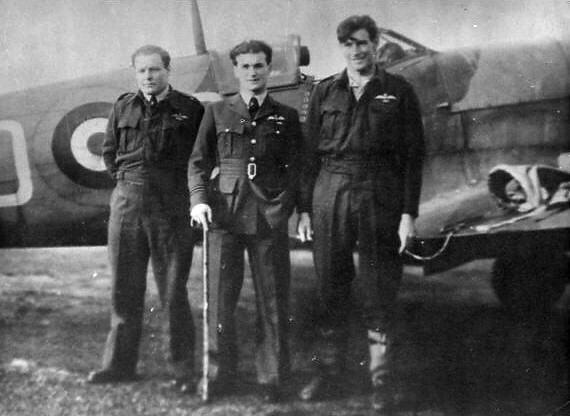 V.
“Paddy” Finucane was an Irishman who became one of the most decorated Spitfire aces during the Battle of Britain. On April 15, 1941, Paddy crossed paths with one of Germany’s highest decorated pilots in history, Oberstleutnant Adolf Galland, shooting up his aircraft so badly that Galland had to bail out on his return route short of the French coast. Bluey Truscott became one of Australia’s best-known flying aces of the Second World War. An RAAF pilot, Truscott was commissioned in February 1941, and then ordered to England where he joined No. 452 Squadron as a foundation member on 5 May. Flying a Spitfire Mk. V, he scored his first victory in August. Thorold-Smith nicknamed “Throttle” was another Australian and a founding member of No. 452 Squadron. A tall man, at 6’3″, he had trouble fitting into the confines of a Spitfire cockpit. All three pilots became aces and advanced rapidly a to the rank of Squadron Leader (Paddy became Wing Commander). Sadly, their careers didn’t last long: Finucane was shot down and killed over the Channel on 15 July 1942. The other two went to Australia but were both killed in March 1943.
his mortal life may have ended gloriously many, many decades ago.but his legend lives on for melineumus to come.